Mumbai: In the budget for 2018-19, the government allocated the largest sum for the Mahatma Gandhi National Rural Employment Guarantee Scheme (MGNREGS), the world’s largest job-guarantee programme, since its launch in 2006. Yet, the allocation was no more than the 2017-18 revised estimate (that approximates actual requirement) of Rs 55,000 crore. In 2012-13, the share of MGNREGS was 55% of the rural development ministry’s allocation, and has since dropped seven percentage points to 48%, IndiaSpend reportedon May 4, 2018. Further, the wage payments to MGNREGS workers have been routinely delayed. Nearly 57% of wages due were unpaid at the end of April 2018, as per government data. The delays were “simply not acceptable”, the Supreme Court said, warning that red-tape could not be “pedalled” as an excuse to deny payment, the Business Standard reported on May 18, 2018. Drèze is a visiting professor at Ranchi University. He has taught at the London School of Economics and the Delhi School of Economics, and has recently authored ‘Sense And Solidarity – Jholawala Economics for Everyone’, a collection of essays from opinion pages written between 2000-17, highlighting his action-oriented research. With Nobel laureate Amartya Sen, he has co-authored ‘Hunger and Public Action’ and ‘An Uncertain Glory: India and Its Contradictions.’ Dreze has travelled across rural India to work and research on social inequality, elementary education, child nutrition, health care and food security. As far as skill formation is concerned, one option would be to reinforce the skill formation component of MGNREGS itself. There is a perception that MGNREGS is just about unskilled work like digging, but in fact, it also includes a skill-formation component. 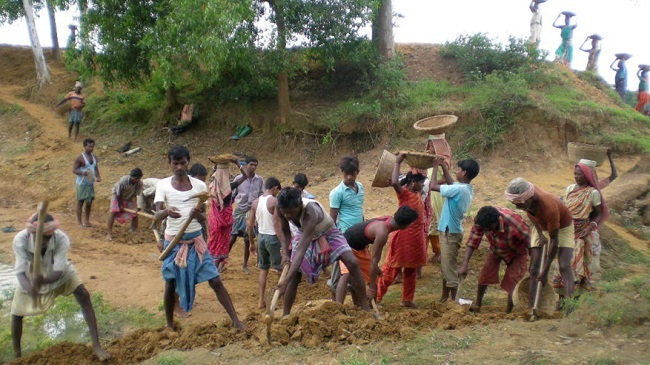 Indeed, aside from casual labourers, MGNREGS employs a large number of people in different capacities–skilled workers, worksite supervisors, barefoot engineers, social auditors, data-entry operators, Gram Rozgar Sevaks [‘village employment assistants’, which are administrative positions], and so on. As agrarian distress rises, the government is attempting to double farmer income by 2022. Could you share your views on universal basic income (UBI) orquasi-UBI to farmers and agriculture labourers as advocated by Arvind Subramanian, the former chief economic adviser to the government of India?